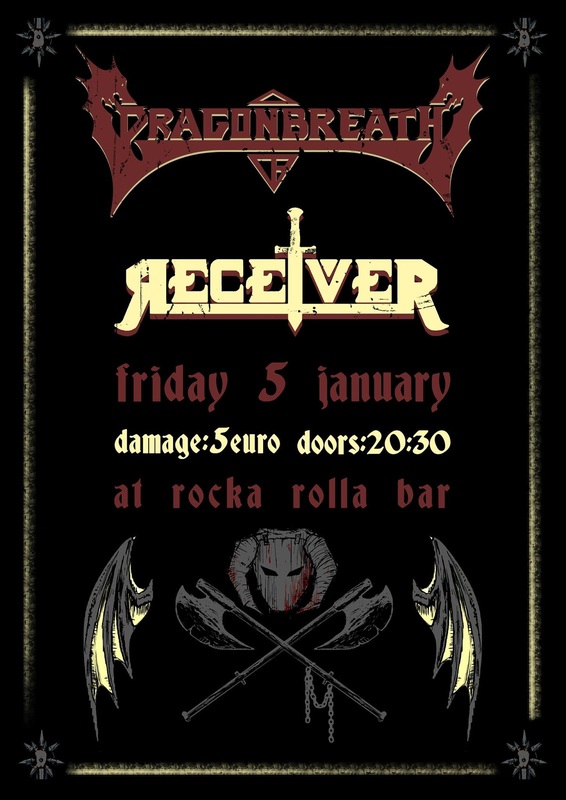 Dragonbreath and Receiver, cheerfully coming from the weeks of festive shenanigans, hit the stage together for one helluva night! Receiver, after years of absence from mother music’s magical world, make a comeback in mild 2018 presenting new material. Dragonbreath, return to the stage after 3 years (some of their members are studying abroad – nefarious ξένιτ, you take the best of lads away), and will play some old beloved tunes along with new ones. When the gig is over, veteran djs of the heavy metal guild will take the lead, showing their prowess in the fine art of music selections. At the same time, a bottle of traditional firewater will saunter around, causing grogginess and a rough wake up in the morning. P.S. : We’d like to thank (Rafael Kallistratou)for the poster! P.S.2: On January 4 (just a day before the live), we attend to the Tuber – Dark Poetry live (more info here: https://www.facebook.com/events/347164179028235/ ), supporting the scene!"